Hostal Palermo is a comfortable 1 star city Hotel. 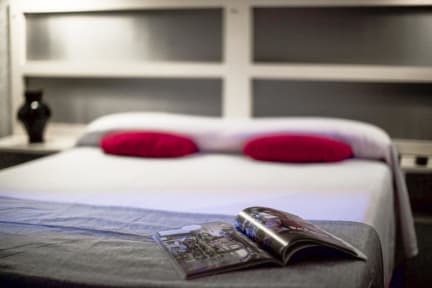 In an excellent location in the heart of Las Ramblas, the Gothic Quarter of Barcelona, offers standard private rooms with free WIFI. 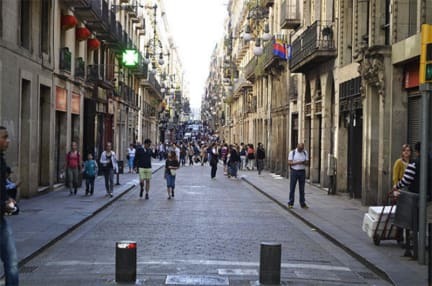 Only 20 minutes from the airport, by public transport to downtown, Hostal Palermo is the smart choice for business or touristic visit in Barcelona. Hostal Palermo is a great value for money. The private rooms are warm and comfortable. Some Balconies overlooking the street. All rooms with wifi, laundry service and towels and bed linen included. In the comfortable and relaxing common room with cable TV, guests can watch movies, football matches live. The rooms have private bathrooms with hot water showers 24 hours. Palermo Hotel offers free Wi-Fi free 24 hours, optional breakfast and late check out 24 hours for your flight very early in the morning, and until 12 noon. Always available at the reception, information about city tours, bars, restaurants and anything you want to ask, we are at your service 24 hours. The receptionists are international and multilingual. Special rates for groups throughout the year. Send us your budget and we will make a special offer. * We charge full amount in case of No Show or notifying less than 48 hours before check in date. **During the check-in at the reception, or during your stay, we can not modify or cancel your reservation. In this case, the Hostel will charge the full amount of the reservation. Please pay attention to this mater to prevent further problems. The cancellation request must be send to our email 1 week in advance. The group will be charge 50% of total amount if the cancellation email is less than 1 week. The booking could be canceled if you dont arrive around the arrival time that is specified in your booking. In some cases we preserve the rights of charging 1 night of your booking as a guarantee. We ask 2 nights obligatory reservation between 30th of December until 1th of January. It means we cannot accept bookings less than 2 nights or out of that period. For the following days, reserves will be fully charged without refund.